On tuesday the 21st of Dec there is one great exhibition taking place at the center of Athens. The name of the exhibition is: SUSPENDED MOMENTS. 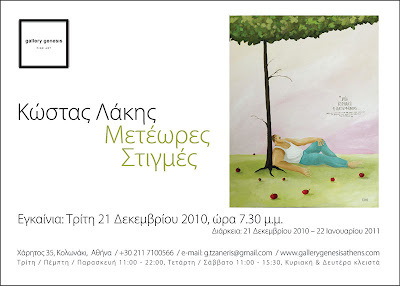 The recent works of Mr. Costas Lakis would be showcased till the 22nd of January 2011. Costas Lakis is one of my most important mentors in my life and my constant artistic development. I've met him before some years ago while I was doing my work placement as a junior art in an ad agency. He was my creative director at that moment and the person who helped me learn to love all the mess my mind constantly had been due to the overdose of information i was taking from work, school, books and generally life. 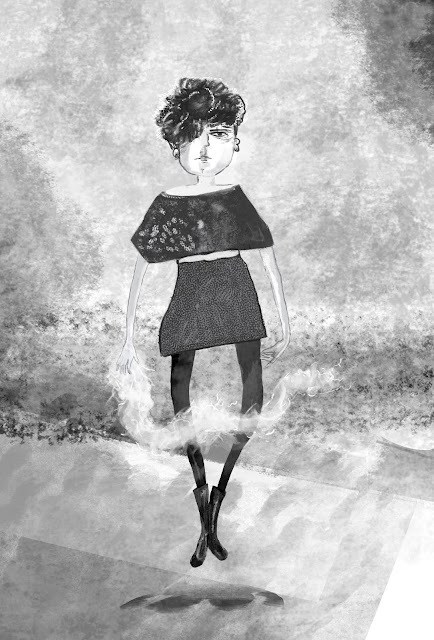 He even encouraged me to transform this mess in images or words and in a way He is the one that showed me the way for developing my love for image making and fragments of words in my illustration as self expression and carrier. He is a very good friend of mine and hope i will have the luxury to enjoy his friendship for the years that will follow. He is a great poet, artist, painter, designer, scenographer, art lover, philosopher, day dreamer, theater writer and the most important a very special friend. I would be in his art exhibition opening on tuesday hoping to get new inspiration and refreshing breath for life. Never have I read such a warm appraisal for an exhibition, and what's really interesting is that the focus is more on the man than the art. Like the way van Gogh's image as a man gives his work an extra something when we imagine him at the easel.